Eloise Corr Danch of New York City is an illustrator, painter, and designer of products, props, sets, and graphics, as well as an imaginative paper sculptor. 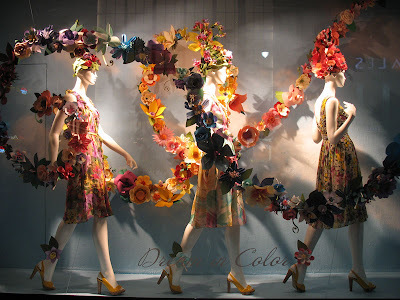 In April, her captivating paper floral work was displayed in the windows of Macy's Herald Square store in Manhattan as promotion of the retailer's 2009 Flower Show. She designed 2500! 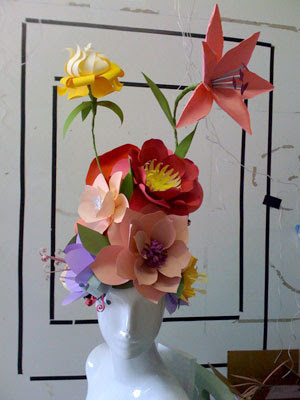 handmade paper flowers, arranged as eye-catching garlands and headdresses. 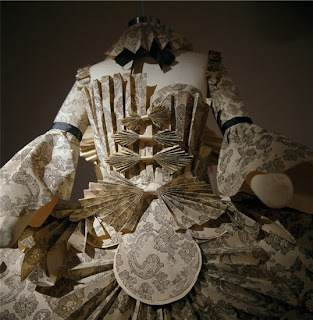 In 2007 she collaborated with the New York design team, Ruffian, to create this elegant Rococo paper dress. Eloise credits the project in launching her fascination with three-dimensional paper design. Last summer her impressively regal paper sculpture, titled Lady Dulcinea, was featured in the gallery of Anthropologie's flagship store in New York's Rockefeller Center. Don't miss Eloise on Martha Stewart's television show tomorrow, Wednesday. She and Martha will be making paper poppies - so timely with Memorial Day on the horizon. Check U.S. local listings for time and channel. The show re-airs on Thursday evening on the Fine Living Network (FLN). Segments are also usually available for viewing on Martha's website.